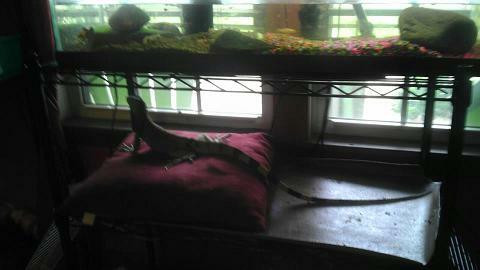 We didn’t go to Petco this Sunday but mom decided Lizzy could come out and explore the house. She got to come out on her own for a while. Looks like she likes it, she’s on my pillow! I can be defensive over my pillow so mom decided the best place to introduce us was in the bath. 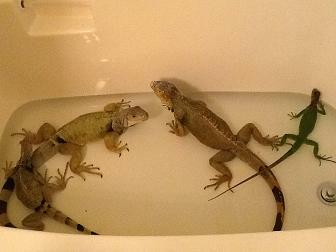 I’m used to sharing my bath with my other friends. But wow this bath tub is getting really crowded! Lizzy has been really nice so far. She hasn’t been biting as much but she’s still scared a lot. She has been letting mom hold her a lot more and seems to be happy just chillin on the couch or by the window. She hasn’t been mean to me at all. 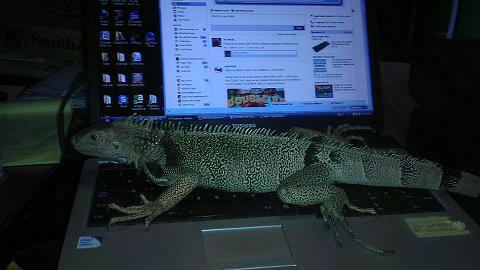 We once had a foster iguana that was mean to me and that’s not cool. But I think Lizzy will make a great foster – or maybe even forever friend :-).